After an almost two-week long dry spell on Tesla Model 3 sightings, they are coming back strong with new red and silver release candidates just in the past few days. Today, we get a good high-resolution look at a blue Model 3 release candidate and in bonus, we see it next to a Model S for perspective. We rarely (if ever?) had the opportunity to see both vehicles side-by-side until now. A blue Model 3 release candidate was spotted today coming out of Tesla’s headquarters in Palo Alto just as a Model S was pulling into the parking lot. Aside from the fairly different front fascia, you can really get the sense of the Model 3 being a shrunk version of the Model S with a much shorter hood and higher B-pillar. Tesla described the vehicle has being about 20% smaller than the Model S.
There doesn’t seem to be any updated feature on the blue Model 3 release candidate. It seems to be the same vehicle spotted last time with the latest charge port door. Before the red and silver prototypes were spotted over the last week, the blue color on the Model 3 led our poll of preferred colors. 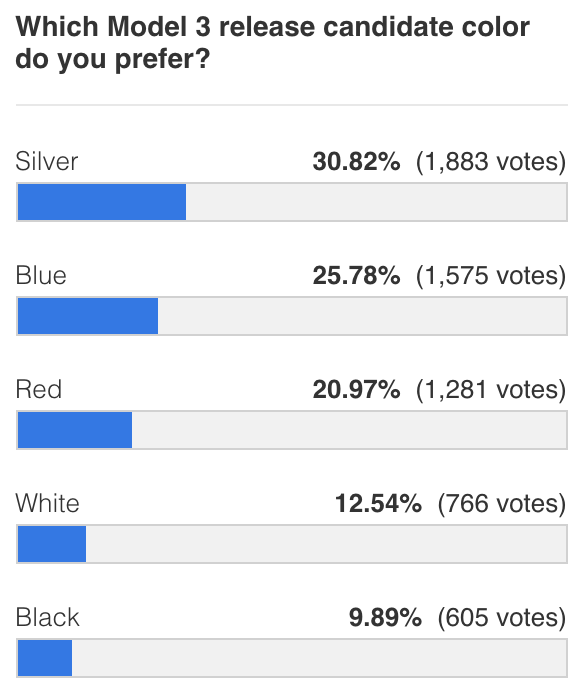 It was surpassed by red, but when silver was spotted yesterday, it stole enough vote from red to make blue the second most popular choice. We also get another glimpse of the interior of the release candidate with this new sighting, but we still can’t see anything new regarding the user interface and certainly no “spaceship-like controls”. Let us know in the comment section below if you can spot anything interesting.